In 1986, old soul tracks had become a familiar sound on television, thanks to ad campaigns shamelessly using nostalgic feelings of the consumer. Levi's jeans advertised with a series of old songs, which in turn were re-released as a single and stormed up the charts. 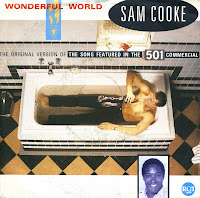 Sam Cooke's 'Wonderful world' was (mis)used for the Levi's 501, and subsequently reached number 2 in the UK singles chart and number 1 in the Dutch Top 40. The song was originally written by Sam Cooke, Lou Adler and Herb Alpert and performed by Cooke with backing vocals by Lou Rawls. When the song was first released as a single in the spring of 1960, it reached number 12 in the US Billboard Hot 100 chart and number 27 in the UK singles chart.